Biying Ni cooks dinner in New York City. After coming to the U.S. in 1981, Ni worked as a nanny for many years before retiring in 2000. She continues to make dishes that she grew up with in China's Fujian Province for her friends and family. Ni prepares and serves deep-fried yellow croakers and chicken soup with Chinese yams. Seafood was a staple in Ni's hometown of Fuzhou, China. "Rich families would eat fish balls and fish dumplings often," she says. "But our family was not well-off, so we only had those during special festivities like Lunar New Year." Plates of drunken pork ribs and deep-fried yellow croaker with savory soy sauce fill the dining table of Ni's home in New York City. "Sometimes there are too many ingredients in a kitchen, and I don't like to use all of them," says Biying Ni, who was born in Fuzhou, the capital of Fujian Province, China. "Fuzhounese cuisine is plain and simple." When you think of Chinese food in the U.S., fried rice, lo mein or General Tso's chicken may first come to mind. But a new museum exhibition in New York City is trying to expand visitors' palates. It features stories of celebrity chefs like Martin Yan and home cooks whose food represents 18 different regional cooking styles of China. "I think it's unfair to just classify one Chinese cooking, per se," says Kian Lam Kho, a co-curator of "Sour, Sweet, Bitter, Spicy: Stories of Chinese Food and Identity in America" at the Museum of Chinese in America. "When you say 'Chinese cooking,' it's like saying 'European cooking,' because Chinese food is just too diverse." Signature dishes highlighted in the exhibition range from Peking duck to cumin lamb skewers from Xinjiang Province in northwest China. "Even with the same dish or same cuisine, every family has a different variation," says Kho, who founded the Chinese cooking blog Red Cook. That's why the curators say if you want to taste the full range of Chinese cuisine in the U.S., you'll need to venture beyond restaurants and into home kitchens, which can play a central role in many immigrants' lives. "The kitchen itself is kind of a sphere of comfort when you come to a new country. You don't understand what's going on. You can't find your ingredients. 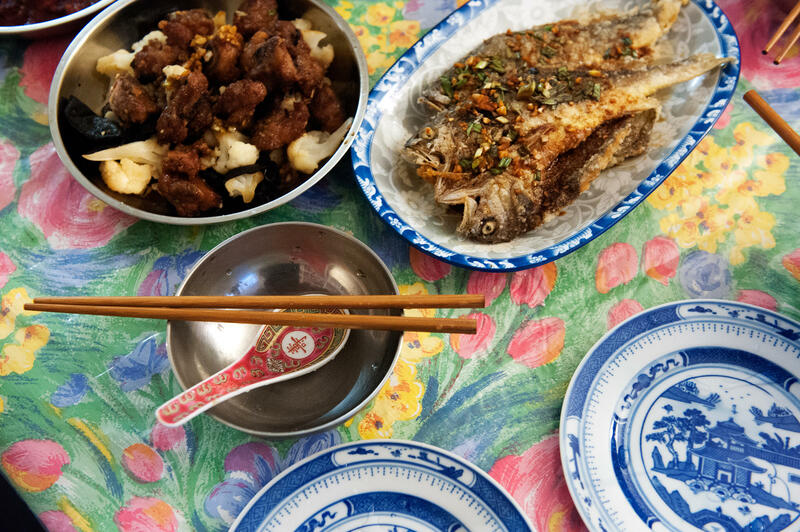 That's the one place where you set up as your home base, and you cook things that you remember from your past," explains co-curator Audra Ang, a former Beijing-based correspondent for the Associated Press and author of the book To The People, Food Is Heaven: Stories Of Food And Life In A Changing China. 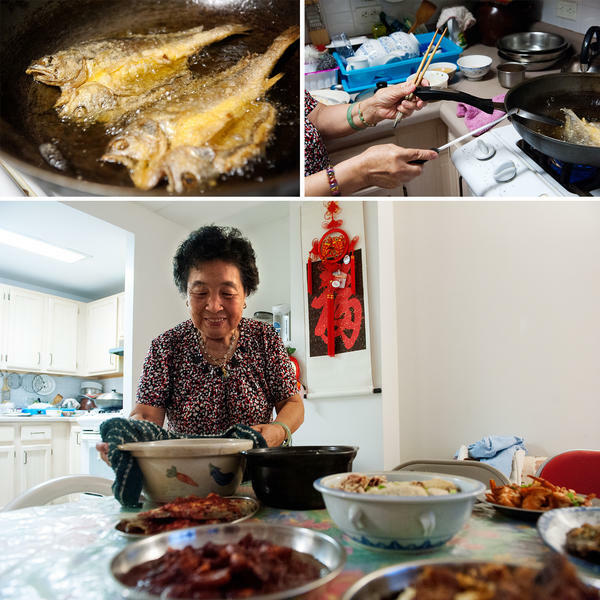 One of the home cooks showcased in the exhibition is Ni Biying, 80, of Manhattan. Born in Fujian Province along China's southeastern coast, she left her home country in 1981 and worked as a live-in nanny in the U.S., where she learned to make Cantonese dishes for a family she was working for. She cooked in other people's kitchens for years before she could afford to rent a home with her own kitchen. These days, though, you can usually find her shuffling around her one-bedroom apartment in beaded, red slippers as a sweet aroma of vinegar and rice wine floats from her stove. For Ni, a small dinner for friends and family means whipping up almost a dozen different dishes. She started practicing in the kitchen after getting married. Some of her techniques she learned from her father, who made most of her family's meals when she was a child. "I still miss the shredded beef with stir-fried celery my father used to make," she says in Mandarin. Seafood was a staple for Ni back in Fujian, where she says she would eat fish every day. In Manhattan, she buys yellow croakers from Chinatown to butterfly, flour and deep fry in the wok. Then, she sometimes tops them off with a savory soy sauce mixed with sugar, vinegar, ground pepper and chopped scallions. But her favorite is a burgundy-colored sauce made with red yeast rice wine lees, or wine dregs – a popular ingredient in some Fujianese dishes. 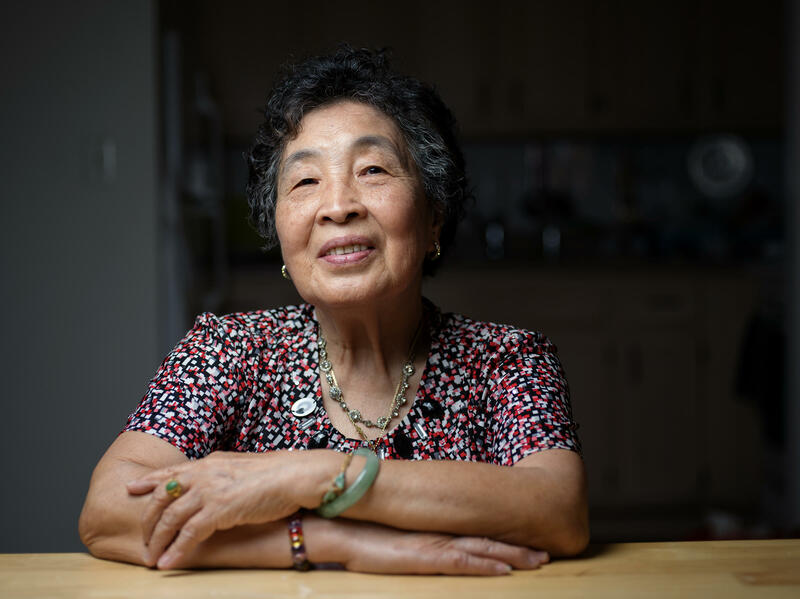 One of her granddaughter Qing Zhuang's favorite recipes is her soup made with chicken or pork broth and chunks of winter melon, which Zhuang remembers eating on her visits home from college. "When I eat them, it's just extremely comforting," she says. It's the kind of comfort food that defines Chinese food for Ni, who has particular tastes. "Cantonese food is too sweet. Sichuanese food is too spicy," she says in Mandarin. But food from her hometown of Fuzhou? "It's not too salty, bland, or sweet," she says. "It's just right." Chinese cuisine is diverse, complex flavors from spicy to sweet depending on the region. A new exhibition at a museum in New York wants to remind people that the country's food isn't all Americanized eggrolls. The exhibition features professional chefs and home cooks. 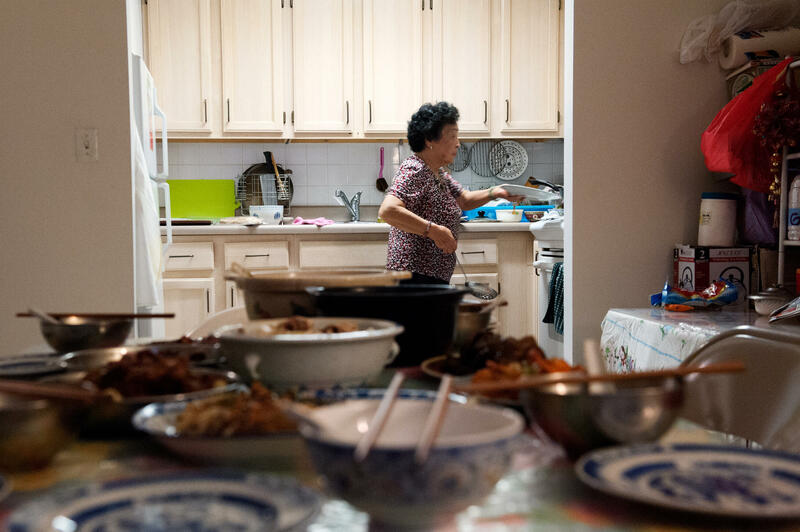 NPR's Hansi Lo Wang recently paid a visit to one of those home cooks in Manhattan. HANSI LO WANG, BYLINE: Here in Biying Ni's kitchen, a small dinner for friends and family means whipping up almost a dozen different dishes. WANG: Ni's stirring together sugar, vinegar, soy sauce, ground pepper and chopped scallions in a small bowl. It's a sauce for one of two fish recipes this evening. This one is for a batch of fresh yellow croakers. Ni says these are smaller than the ones her father used to cook in Fujian Province along China's southeastern coast, but they're just as good for butterflying and flowering before a deep fry in the wok. WANG: "I used to eat fish every day back in my hometown," Ni says in Mandarin. On our dining table, there's already another plate of fried fish smothered in a burgundy colored sauce. It's made with wine dregs from red yeast rice wine and gives the fish a rich, savory taste that can be hard to find at your local Chinese takeout. KIAN LAM KHO: I think it's unfair to just classify one Chinese cooking per se. WANG: Kian Lam Kho is a curator of the new exhibition at the Museum of Chinese in America. KHO: When you say Chinese cooking, it's like saying European cooking because Chinese food is just too diverse. WANG: The museum has gathered the stories of Biying Ni and other Chinese cooks around the U.S. Their signature dishes span from Peking duck to cumin lamb skewers from Xinjiang Province in northwest China. KHO: Even with the same dish or same cuisine, every family has a different variation. WANG: That's why the curators say if you want to taste the full range of Chinese cuisine in the U.S., you'll need to venture beyond restaurants and into home kitchens, which co-creator Audra Ang says can play a central role in many immigrants' lives. AUDRA ANG: The kitchen itself is kind of a sphere of comfort when you come to a new country. You don't understand what's going on. You can't find your ingredients. That's the one place where you set up as your home base, and you cook things that you remember from your past. WANG: Biying Ni, who recently turned 80, says she loves cooking for her friends. NI: Growing up, though, she says, making meals was her father's job. She left China in the 1980s and worked as a live-in nanny in the U.S. where she learned to make Cantonese dishes for a family she was working for. For years she cooked in other people's kitchens before she could afford to rent her own home. Now she shuffles around her one-bedroom apartment in beaded, red slippers. A sweet aroma of vinegar and rice wine floats from her kitchen. After a quick rinsing of chopsticks, spoons and bowls, dinner is finally ready. Ni's granddaughter Qing Zhuang and Zhuang's boyfriend, David Wu, are gathered around the table. QING ZHUANG: He's from a different province. He's from Shanghai. WU: I have a different palate. WANG: Still, Ni's drunken chicken made with Fujianese cooking wine hits the right spot. WU: It's very light. It retains some of that flavor in the cooking wine that really feels refreshing and cooling. WANG: For Qing Zhuang, one of her favorites is her grandmother's winter melon soup. ZHUANG: I went to college out of state, and whenever I come back - and especially the soup, you know - there's herbs in there and these winter melons. When I eat them, it's just extremely comforting. WANG: It's a kind of comfort food that defines Chinese food for Biying Ni, who has particular tastes. WANG: "It's not too salty, bland or sweet," she says. "It's just right." Hansi Lo Wang, NPR News, New York. Transcript provided by NPR, Copyright NPR.